Most computer users like to make things easier for themselves because there can be a lot of pointing and clicking while using your PC. Although keyboard shortcuts are a big time saver, many people are not proficient enough using just a keyboard and prefer to use a mouse to perform tasks. One thing you can do is use gestures and they are more common than you might think. Phones, tablets and touch screen computers use gestures all the time. Actions like swiping from side to side, pinch zoom or even sliding down to scroll are all types of gestures. For a traditional keyboard and mouse things are a bit different. A mouse gesture is simply pressing a mouse button and dragging the mouse in a specified direction or pattern. Windows has no built in method to use an ordinary mouse gesture to do things like open programs or execute keyboard shortcuts. They are quite common in web browsers though, with Opera, Vivaldi, Cent Browser, Slimjet and others having the feature built in. 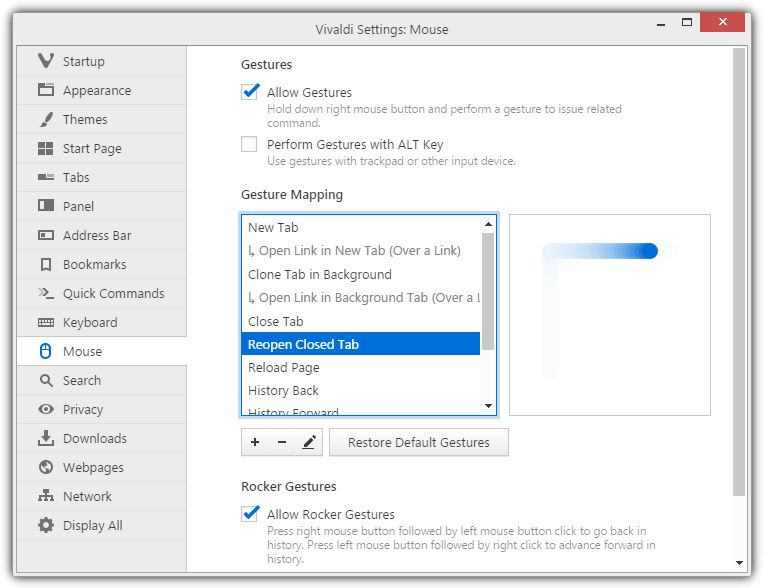 Failing that, Firefox and Chrome extensions for mouse gesture are available. Having mouse gestures in a supported web browser is one thing but if you want to use them within Windows itself, Internet Explorer/Edge or your favorite software, a third party solution is needed. 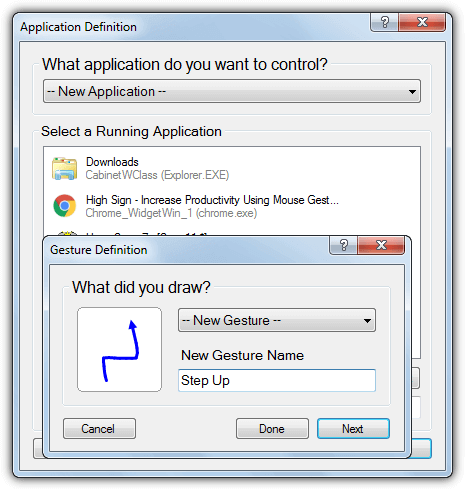 Here we show you 5 mouse gesture programs to make your computing tasks a bit easier. All were tested in Windows 7 and 10. While StrokesPlus is free and reasonably up to date, the developer is working on a new version. That will be shareware though and means development of the free version will likely be just the odd minor update. This program is feature rich but it comes at a cost, StrokesPlus is not very user friendly and requires scripting to get it working. There is ample online help available, which is needed as you will be referring to it a lot getting your gestures to work. There are around 35 already configured gestures which cover global actions in all programs, Windows Explorer and Chrome, Firefox and Internet Explorer. Adding a new program to the list is quite easy and you only have to click the Add App button, give it a name and drag the find window target icon over an open window of your program. Then click Apply. To add a gesture select the application and click Add Action, then you can choose from one of the known drag gestures or create your own. This part is quite powerful because it can also use the scroll wheel and rocker gestures. Adding an action is the difficult part and where Strokes Plus becomes problematic because it relies on small pieces of Lua Script and you have to know the right commands and syntax to get the action to work with the gesture. For instance, the hotkey for our screenshot software would be Ctrl+Shift+A, but in Lua Script the command would be “acSendKeys(“^+a”)”. It will take time and effort to get all the gestures you want. Strokes Plus also has an exclusion list, the option to use left/right/middle buttons as the trigger, custom hotkeys and a useful right click tray menu. It also has a portable version and amazingly only consumes around 300KB of RAM in the background. If you have patience and can persevere, Strokes Plus is a very good and powerful tool. The gMote software has not been updated since 2008 but it’s still a potentially useful tool. What might make it appealing is it’s a relatively good blend of being easy enough to use while still having enough features and functions for most users. Another plus is gMote comes as a portable program so no installation required. 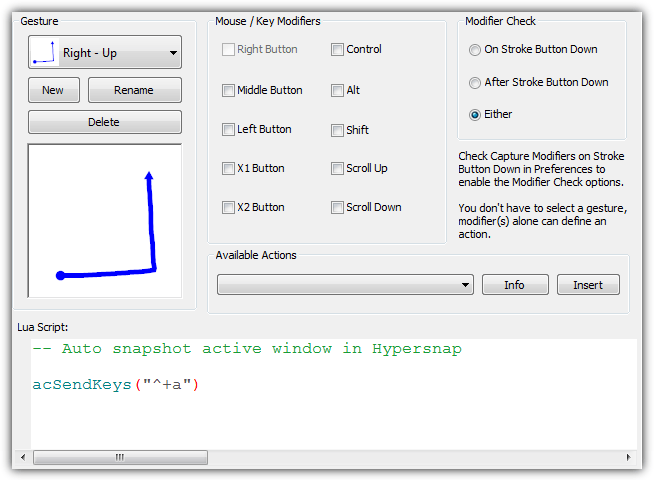 Adding a gesture to the program is quite simple, click on Create Gesture and draw a pattern in the window you wish to associate with that gesture. If you are not happy with it press Record again. Click the new gesture on the left and use the default action drop down to select what you want the gesture to do. The options are do nothing, open a program, open a folder, open a website, use a key combination or one of the predefined options for browser, media player or Windows (Explorer). gMote uses gesture sets which saves or loads the predefined gestures applied to that set. Specific programs can be added to each set so you can apply different actions for a single gesture. 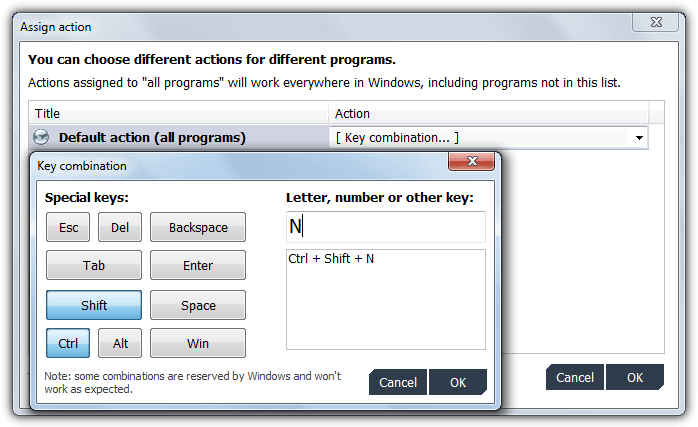 To do that click on Configure programs, add the programs to include in the set, then when you click on the gesture to apply actions, the programs will appear in the window below the default actions option. From there you can choose in the drop down what you want each program to do when the gesture is used. 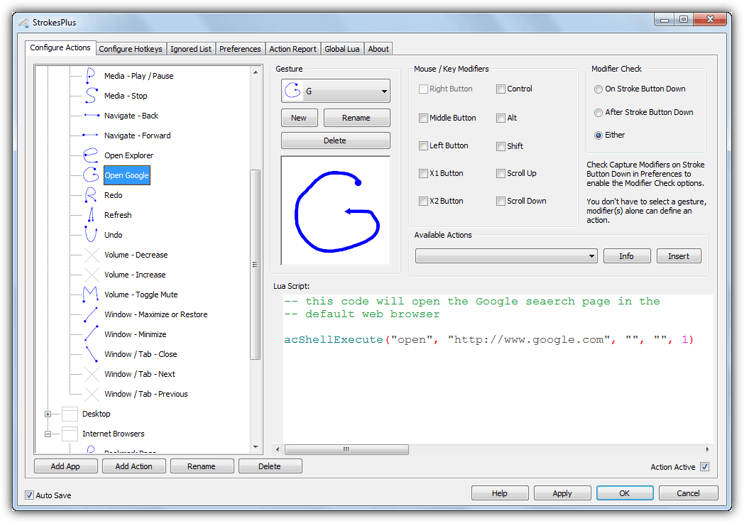 In addition to the right mouse button, gMote also accepts gestures when you use mouse drag in combination with Ctrl+Shift, Ctrl, middle mouse or Ctrl+middle mouse. Programs to exclude from gestures can be added through the Options window. You might as well disable the check for updates as it’s unlikely there will ever be any. gMote used about 35MB while sitting in the tray. High Sign is open source and a bit old dating from 2009. The author of Strokes Plus is a former developer and pays credit to High Sign for making his program possible. It’s one of the easiest and cleanest mouse gesture programs to use but it lacks more advanced features. For instance, there is no exclusion list and the option to use another mouse button other than right was never finished. After install, High Sign starts in training mode which records any gesture you perform with the right mouse button held down. Double click the tray icon to turn training mode off or on. If you’re happy with the gesture, click Next and decide whether to apply it to all applications, a currently running application or one of four that are already defined. The number of available actions are slightly limited but should be adequate for many users. From the drop down you can select opening the default browser, send a hotkey combination, send keystrokes, run a command or program or manipulate an open window. 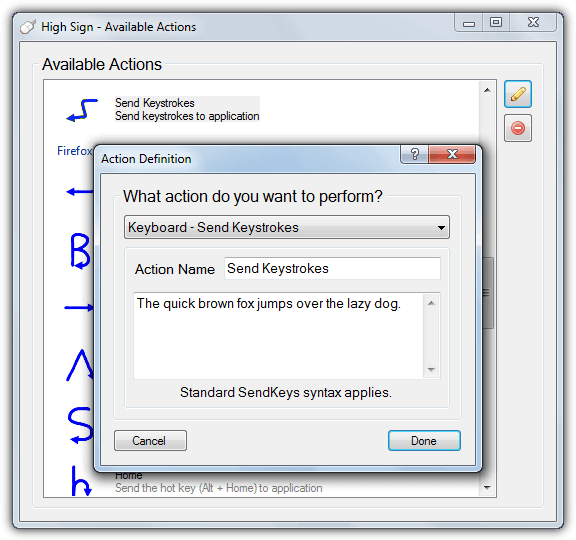 The send keystrokes option is useful because you can send blocks of text to Word, Notepad or even online forms. Right clicking the tray icon allows you to view all entered gestures or view and edit the actions that have been applied to the gestures. By default the program comes with around 30 preset gestures for Explorer, Firefox, Internet Explorer and a general set for all applications. Go to Preferences to start High Sign in Gesture mode once you have finished training. The program uses about 15-20MB of memory while in use. Although High Sign works in Windows 10 it is a little inconsistent, working fine on some occasions and not others. 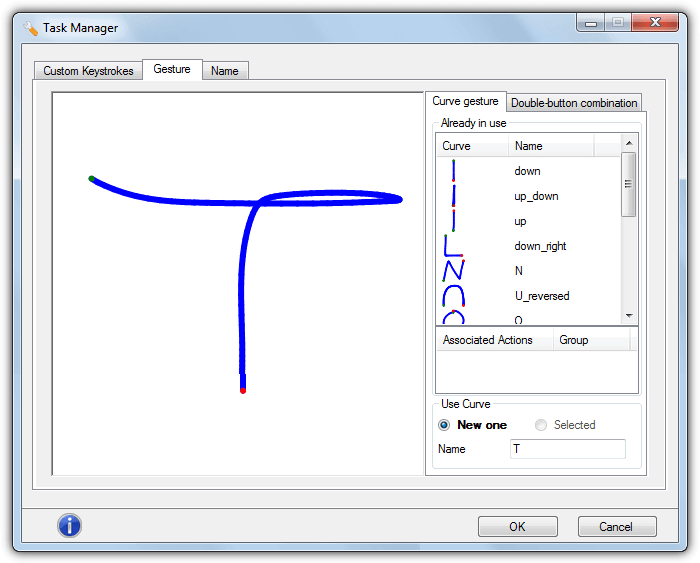 The author of Just Gestures released what he called probably the last version of the program in 2015, version 1.5. It was also made open source on Github so anyone else can continue the project if they want. Just Gestures has a reasonable combination of features and usability including whitelisting, blacklisting and an auto enable mode. A post install a wizard will popup asking which gestures to enable and which mouse button to hold down. Curve Gesture is the normal hold down and drag method, Double Button Combination is commonly known as rocker gestures while Wheel Button Combination can perform tasks by using the scroll wheel. 13 global gestures are already configured and another 6 are for the system’s default web browser. 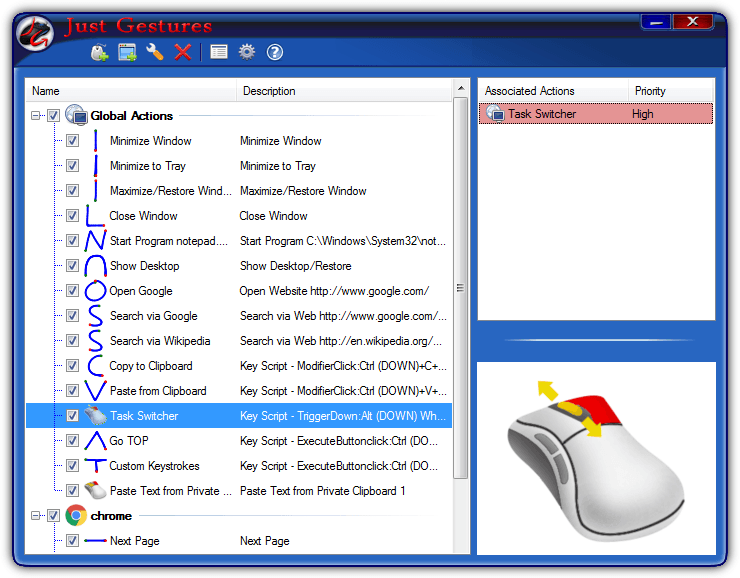 To create a gesture click the far left button in the toolbar, choose a gesture type from the category and whether the gesture will be global or applied to specific application. Gesture types are split into categories of window options, Windows shell, audio volume, media, internet, send keystrokes and wheel button actions. When using custom keystrokes make sure to use modifier key down first, then the shortcut key, then modifier key up. To finalize creating the gesture you need to supply the mouse drag movement. 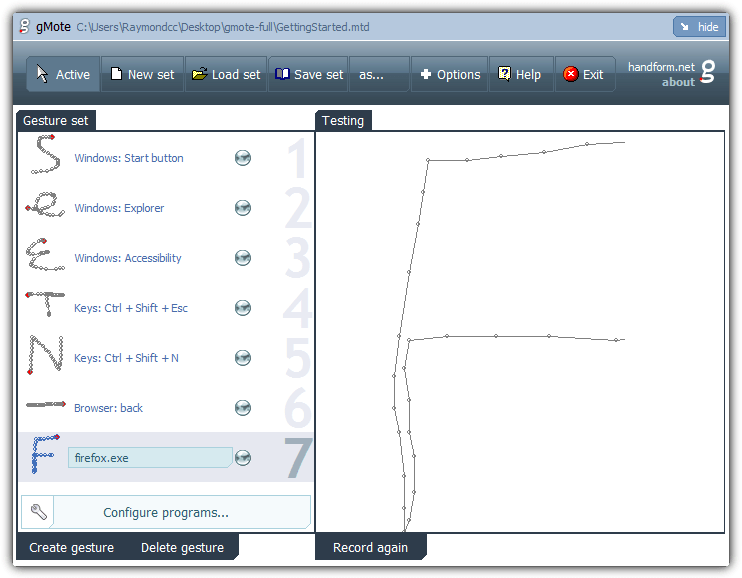 Hold the left mouse button and draw the shape in the box, and optionally give the curve a name at the bottom. Finally give the gesture itself a name and it will be created ready to use. Note that if you create two actions for the same gesture you may be presented with a small context menu asking which action to use. Just Gestures used around 20MB in the background. In Windows 10 use the 32-bit version even if you are using Windows 10 64-bit, or the gestures won’t work. 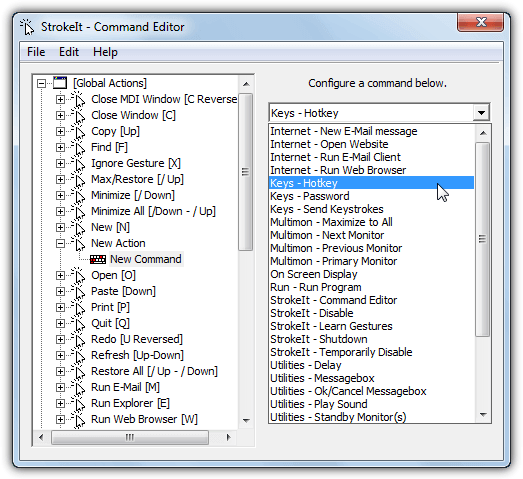 StrokeIt is another tool that unfortunately has not been updated recently, the last release was in 2010. What makes this program useful is it’s extremely light on system resources so is ideal for old or low power computers. The downside is the lack of help or documentation which it clearly needs because StrokeIt isn’t novice friendly. Although not perfect, we did find an old StrokeIt Wiki page at the Internet Archive which can help with how the built in gestures work. 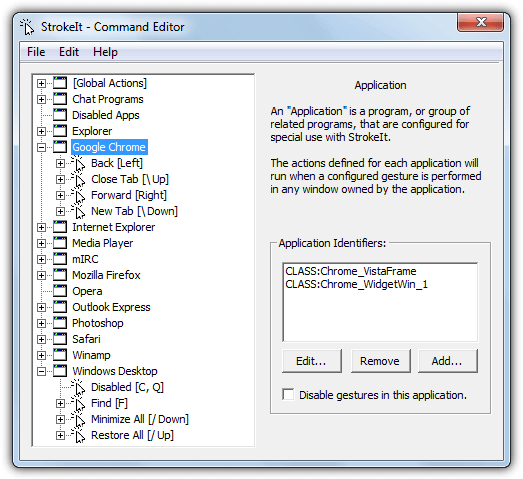 StrokeIt gives you a head start in terms of gestures because around 80 are preconfigured already. These include mIRC/AIM, Chrome, IE, Firefox, WMP, Photoshop and Winamp. Others like Outlook Express and Safari are probably of no use anymore. Some applications require updating though, for instance, Chrome needs a new application identifier. Click Add and drag the finder onto the Chrome window. This will add the Chrome_WidgetWin_1 class and make the gestures work on Chrome. Creating gestures is possibly a three step process. Optionally right click > New application to create a new program to use gestures in, then add an identifier dragging the finder tool onto the program’s window. Secondly, right click on the app > New Action and pick a gesture from the drop down list or create your own by dragging an unknown gesture. Click Add Gesture to add it to the action. Lastly right click on the new action > New Command. There’s a ton of commands to choose from, including internet options, monitor options, manipulating windows, sending hotkeys or keystrokes, opening programs, an on screen display, even sounds or simple message boxes. Note that you can use the right, left or middle button to trigger the gestures, change it from the Prefs window. StrokeIt has minuscule memory usage of around 300KB while sitting in the tray. gMote is the best for me. It works almost perfect in Windows 10 x64. Doesn’t work with Edge only. Just must open it as administrator. Otherwise doesn’t work with some programs and windows like Task Manager or Disk Management etc.